Kamehameha Schools presented at $2,000 check Aug. 6 to the Equip the Kitchens Campaign for the future Hawaii Community College-Palamanui campus. The presentation was made during the ACF Kona Kohala Chefs Association’s monthly luncheon meeting at Roy’s Waikoloa Bar and Grill. 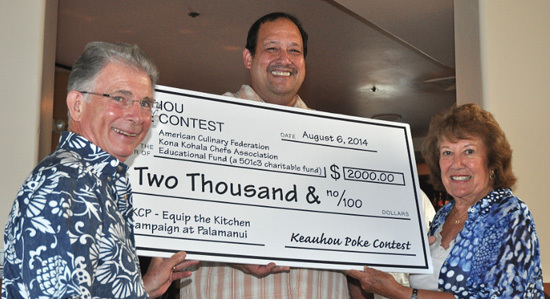 The donation was funded from proceeds garnered at the 2014 Sam Choy’s Keauhou Poke Contest. In addition, Kamehameha Schools donated $2,000 to the Kealii Pauahi Foundation. The $200,000 Equip the Kitchens Campaign will fund kitchen appliances and equipment at Phase 1 of the long-awaited campus under construction just north of Kona International Airport. Save the date for the fourth annual Sam Choy’s Keauhou Poke Contest on Sunday, March 15, 2015 at the Sheraton Kona Resort and Spa at Keauhou Bay. Sam Choy’s Keauhou Poke Contest is part of Kamehameha School’s annual Kamehameha III celebration that commemorates the Keauhou-born king, Lani Kauikeaouli. The contest is sponsored by presenting sponsor Kamehameha Schools, in partnership with Aloha Shoyu Company, Suisan Company Ltd., Hawaiian Springs, Hamakua Mushrooms, West Hawaii Today, the Sheraton Kona Resort and Spa at Keauhou Bay, Fresh Island Fish, Coca Cola, BMW of Hawaii, Tanioka’s Seafood & Catering, Sam Choy’s Kai Lanai, Roberts Hawaii, Bacardi, Sun Dried Specialties, Kapa Radio and Young’s Market Co.